This is the Parish Church, looking down the main aisle. 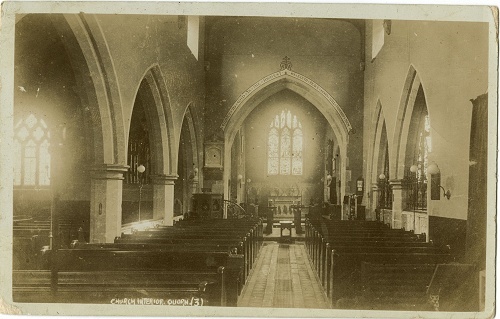 The card was posted on 16th October 1905 and is addressed to Mrs S Randon, 6 Chancel View Terrace, Lipson, Plymouth. The message says "This is the best I can get of the interior. Quorn is famous for hunting AJH (?)" The card is written upside down, which was not uncommon as a method of deterring the postman from reading postcard messages!